Two new Musket Smoke maps coming in next update. The map designs are being offered by a player – armin1962. So they should be interesting as he has a LOT of experience with Musket Smoke. His red pie count is 658 at the moment. The maps are for mini matches and are size medium and large – mostly defensive style. I won’t be able to get to this task until next weekend as I am still crunching for a new Job. After things settle down a bit at the new job updates will start coming more frequently. In the meantime the new maps can help keep things fresh. 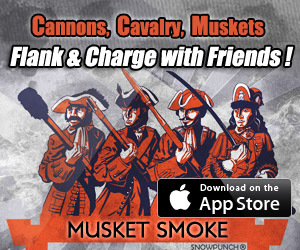 iPadBoardGames posts a great review of Musket Smoke! Nice to see another review for Musket Smoke. Please vote for us on that website as games are ranked 1-10 so help us get the rating that Musket Smoke deserves! High marks for Musket Smoke! People all over the world have spoken. This is a months worth of Musket Smoke ratings. It’s low in quantity but high in praise. Those that actually download and get into the gameplay – really do love it.